Spring is definitely peeking though (and we love her) but until she is here for good, I have been spending the last chilly days I have in casual chic style. I will always rock a fierce heel but when I work a lot (which seems like always nowadays), I tend to gravitate towards low-key looks in my downtime. Today's outfit is a perfect example of casual meeting chic. It's completely comfy with an edge. 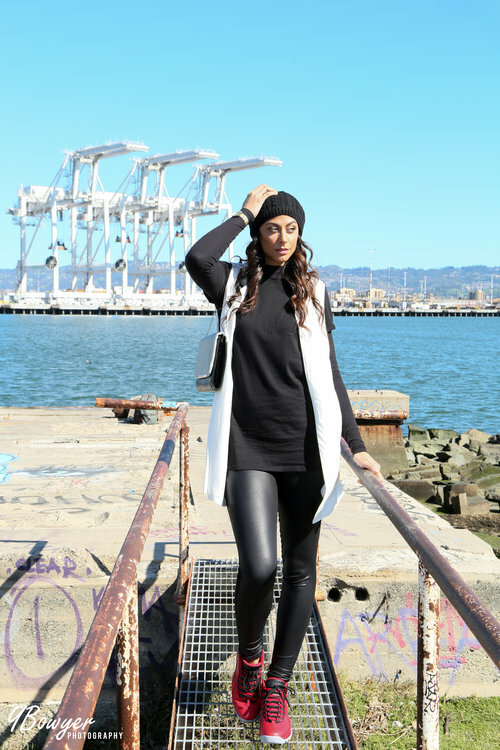 The longline vest (which can be dressed up or down), gives the all black a pinch of drama and the pop-of-red Jordans pull the whole look together. The oversized clutch really wasn't strategically planned. I simply picked it because a bag wouldn't flow but I had a lot of stuff to carry that day. Now you may notice that I am wearing my trusty Long Sleeve Jersey Body from the TTYA x Long Tall Sally collection and that is because I wear it with everything! It's one of those famed, basic pieces that you can layer with pieces that are not necessarily tall (like the longline vest). Invest in the basics and you will unlock a whole new wardrobe! So that's my version of casual-chic dahling...what do you rock in your downtime beautiful?